Registered nurses can advance their careers with a Master’s in Nursing Administration degree online. This program, which can take less than two years for completion, prepares graduates for positions as nurse executives, nurse managers, and other administrative positions in healthcare. This lucrative career can draw an average annual salary of $100,000, with the Bureau of Labor Statistics (BLS) projecting a job growth of 20% by 2026. The flexibility of online nursing administration programs may appeal to RNs who want to balance work with school. After graduation, nurse administrators can work in a variety of management positions throughout the healthcare system. 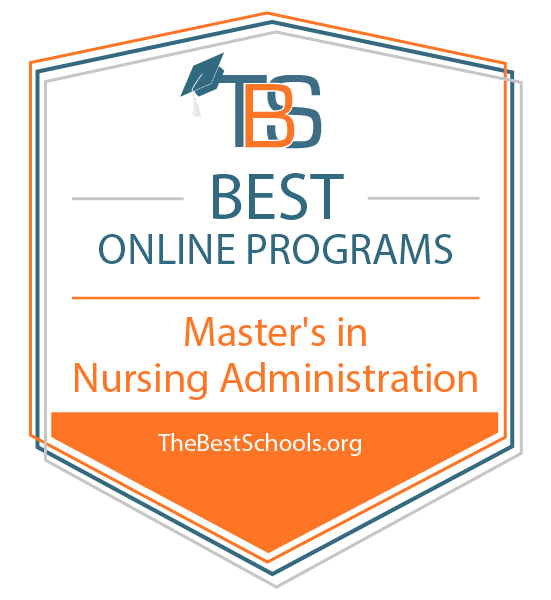 What Else Can I Expect From an Online Master’s in Nursing Administration Program? George Washington University, GW Online ranks #1 on The 25 Best Online Master’s in Nursing Administration Degree Programs! Located in the heart of the nation’s capital, George Washington University was founded by an act of the U.S. Congress in 1821. The school’s Foggy Bottom campus sits just blocks from the White House, the State Department, and the Washington Monument. A leading research university, GW conducts medical studies and operates a 371-bed hospital. GW also provides online degree options, including an online MSN in nursing leadership and management. The nursing leadership and management program emphasizes strategic thinking, policy decision making, and leadership. GW’s online master’s degree in nursing administration requires 36 credits and offers full-time and part-time options. The curriculum includes coursework in nursing leadership, evidence-based practice, and leadership coaching in nursing. Students also participate in a leadership capstone practicum. Full-time students can complete the degree in just over a year. GW recommends that full-time working nurses opt for the part-time option, which takes two years. Prospective students must have a bachelor’s degree in nursing from a regionally accredited college or university. GW prefers students with a minimum 3.0 GPA. Applicants provide official transcripts from all postsecondary schools, two letters of recommendation, a current resume, and a personal statement. Nursing candidates must also hold an active and unencumbered nursing license. Admitted students complete a virtual new student orientation. George Washington University is regionally accredited by the Middle States Commission on Higher Education (MSCHE). The GW School of Nursing also holds accreditation from the Commission on Collegiate Nursing Education (CCNE). University of St. Francis ranks #2 on The 25 Best Online Master’s in Nursing Administration Degree Programs! Founded in 1920 by the Franciscan order, the University of St. Francis educates 1,700 students through its main campus in Illinois and an additional 2,400 students through online learning. The Catholic institution, located 35 miles from Chicago, features a low average class size of 16 students. The school’s online MSN in nursing administration prepares RNs to manage nursing personnel and services. USF also offers an RN-BSN-MSN pathway for registered nurses seeking graduate education. In addition to core nursing courses, students learn about the principles of healthcare administration, human resources, financial management, and managed care operations. The degree requires 36–45 credits, including 16 credits in graduate nursing core classes, 20 credits in advanced administration courses, and nine credits of optional education courses. This online master’s degree in nursing administration appeals to nurses who want training in both administration and nursing education. USF nursing students must complete a minimum of 27 credits through the school, including all practicum courses. To enroll at USF, nursing candidates must have a minimum 3.0 GPA in undergraduate work, two years of full-time clinical nursing practice in the last four years, and a valid registered professional nurse license. Applicants submit official transcripts, an admissions essay, a professional resume, and two letters of recommendation. Candidates also complete an interview with one or more faculty members from the college of nursing. The University of St. Francis is regionally accredited by the Higher Learning Commission (HLC). The Leach College of Nursing also holds accreditation from the Commission on Collegiate Nursing Education (CCNE). Clarkson College ranks #3 on The 25 Best Online Master’s in Nursing Administration Degree Programs! When it was founded in 1888, Clarkson College was the first school of nursing in the state of Nebraska. Today, Clarkson specializes in educating healthcare professionals through its Omaha campus and online degree options. The online MSN in healthcare administration at Clarkson trains nurses to manage the design, implementation and evaluation of health care delivery systems. Nursing students complete 42 credits of coursework, including 17 credits in core courses such as nursing ethics and law, applied statistics, and healthcare delivery systems. Students then take four credits in evidence-based practice research projects. During this sequence, nurses write an article for a practice research journal. Lastly, learners complete 21 credits in the healthcare administration focus. These courses include organizational behavior, finance for healthcare leaders, and a nursing healthcare leadership practicum. Applicants to the online master’s degree in nursing administration must submit official transcripts demonstrating a minimum 3.0 GPA. Candidates should provide proof of a valid RN license, a BSN from an accredited school, and two years of professional RN work experience. The application also requires an essay, two professional references, and a resume. Newly admitted students start in August, January, and May. Students can apply up to nine credits of graduate-level coursework toward the degree. Clarkson College is regionally accredited by the Higher Learning Commission (HLC). The nursing program also holds accreditation from the Accreditation Commission for Education in Nursing (ACEN). Stony Brook University ranks #4 on The 25 Best Online Master’s in Nursing Administration Degree Programs! Part of the State University of New York system, Long Island’s Stony Brook University dates back to 1957. Stony Brook holds the record as the largest single-site employer on Long Island. The university also operates campuses in Manhattan and South Korea. In addition to on-campus degrees, Stony Brook offers several online degree options, including an MSN in nursing leadership. Unlike many other master’s in nursing administration online programs, Stony Brook requires scheduled on-site immersions in New York. The 36-credit curriculum incorporates core classes in organizational leadership, healthcare policy, and research. Nursing leadership courses include business skills for nurse leaders, finance and economics, and advanced theory and practice in nursing leadership. Nurses enrolled in the program complete field work requirements at approved sites in their local communities. The hybrid program follows a cohort model. Prospective students should have either a BSN or a bachelor’s degree in a non-nursing field and nursing experience. RNs who majored in an area other than nursing must submit a clinical practice portfolio for review. All applicants submit proof of an RN license, three letters of recommendation, a resume, and unofficial transcripts from all colleges and universities attended. Candidates should hold a minimum 3.0 GPA. Stony Brook University is regionally accredited by the Middle States Commission on Higher Education (MSCHE). The School of Nursing also holds accreditation from the Commission on Collegiate Nursing Education (CCNE). Indiana Wesleyan University ranks #5 on The 25 Best Online Master’s in Nursing Administration Degree Programs! Founded in 1920, Indiana Wesleyan University-Marion is the largest private university in the state. In addition to its resident undergraduate programs, IWU specializes in adult, graduate, and online education. IWU’s school of nursing offers an online MSN in nursing administration designed for working nurses pursuing career advancement. Nurses enrolled in IWU’s fully online nursing administration master’s program complete 41 credits of coursework. IWU students take classes sequentially one at a time. Required classes include evidence-based communication, professional role development for the nurse administrator, and advanced nursing management. Nursing students also complete a practicum to gain nursing administration experience. Students typically earn the MSN in 22 months. To gain admission, prospective students must hold a BSN with a minimum 3.0 GPA from a regionally accredited institution. Nurses who do not meet the GPA requirement can gain provisional admission. Candidates submit official transcripts, three letters of professional reference, and proof of an unencumbered registered nursing license. IWU also considers RNs with bachelor’s degrees in a non-nursing fields who have a minimum of 10 years of experience in nursing practice. The nursing program offers multiple start dates throughout the year. IWU does not charge an application fee. Indiana Wesleyan University is regionally accredited by the Higher Learning Commission (HLC). The School of Nursing also holds accreditation from the Commission on Collegiate Nursing Education (CCNE). Seton Hall University ranks #6 on The 25 Best Online Master’s in Nursing Administration Degree Programs! Dating back to 1856, Seton Hall University is a private Catholic school founded by Bishop James Roosevelt Bayley. The university’s campus in South Orange, New Jersey, sits just 14 miles from Manhattan. SHU offers more than 90 on-campus and online degree options, including an MSN in health systems administration. The online master’s degree in nursing administration at SHU builds skills in hospital administration, strategic planning, and care delivery. The curriculum includes four core nursing courses and seven classes in health systems administration. Students complete coursework in case management, legal and risk management issues in healthcare, and nursing and health systems administration. The 30-credit degree takes about two years to complete. Online students arrange 85 clinical hours at an approved local site as part of their managerial internship. This field experience helps students develop management competencies in a healthcare organization. Candidates for admission at SHU must hold a BSN with a minimum 3.0 GPA from a nationally accredited nursing program. Applicants also submit a statement of professional goals, one professional letter of reference, one academic letter of reference, and proof of a current RN license. Courses follow an asynchronous format. SHU does not require any on-campus visits. Seton Hall University is regionally accredited by the Middle States Commission on Higher Education (MSCHE). The College of Nursing also holds accreditation from the Commission on Collegiate Nursing Education (CCNE). Nova Southeastern University ranks #7 on The 25 Best Online Master’s in Nursing Administration Degree Programs! Originally a technical graduate institute, Nova Southeastern University now offers more than 150 programs in fields such as bioinformatics, medical sonography, and health science. The university introduced its first distance learning program in 1972, making it one of the first schools to do so. The institution offers professional degrees in several health-related fields, including an online MSN in executive nurse leadership. Designed for working nurses, the MSN program at NSU prepares nurses for leadership roles in healthcare facilities. The 36-credit master’s in nursing includes courses in fiscal management for complex health systems, nursing decision making, nurse leadership roles, and the business and economics of healthcare. Students complete a nursing health systems leadership practicum to build clinical leadership experience. Unlike most online nursing administration programs, NSU provides a bridge option for RNs without a bachelor’s in nursing. Nurses with an associate degree can meet admission requirements by completing NSU’s transition program prior to beginning the MSN. Non-bridge candidates must hold a BSN with a minimum 3.0 GPA from an accredited nursing program. All applicants must hold an active professional nursing license. Prospective students complete both the NursingCAS application and NSU’s general application. Nova Southeastern University is regionally accredited by the Southern Association of Colleges and Schools Commission on Colleges (SACSCOC). The College of Nursing also holds accreditation from the Commission on Collegiate Nursing Education (CCNE). Pennsylvania State University - World Campus ranks #8 on The 25 Best Online Master’s in Nursing Administration Degree Programs! Established in 1998 as an eLearning branch of the state’s public university system, Pennsylvania State University World Campus provides more than 150 online degree and certificate programs. As the second largest campus in the Pennsylvania state university system, Penn State World Campus enrolls nearly 18,000 students. The school’s online MSN with a focus in nursing administration prepares students for jobs as nurse managers, nurse executives, quality improvement directors, and staff developers. Penn State’s online master’s degree in nursing administration includes core courses in nursing and a specialized leadership curriculum. The 37-credit degree builds advanced knowledge of organizational leadership, health policy, and executive leadership. Students customize the degree by choosing nine credits of administration electives from options such as human behavior and organizational performance, public organization and management, and administration in higher education. All students take a four-credit clinical practicum and a three-credit capstone project. Prospective students must have a current license to practice professional nursing in the U.S. and a BSN from a nationally accredited nursing program. Applicants submit official transcripts from each institution attended. Penn State prefers students with a minimum 3.3 GPA. The MSN program does not require GRE or GMAT scores. Candidates should provide two references and a personal statement. Penn State offers the same online tuition rate for Pennsylvania residents and non-residents. Pennsylvania State University-World Campus is regionally accredited by the Middle States Commission on Higher Education (MSCHE). The College of Nursing also holds accreditation from the Commission on Collegiate Nursing Education (CCNE). Winona State University ranks #9 on The 25 Best Online Master’s in Nursing Administration Degree Programs! Originally founded in 1858 as a school for elementary teachers, Winona State University is the oldest member of the Minnesota state college and university system. Today, WSU offers more than 80 degree options, including an online MSN in nursing leadership for nurses seeking career advancement. Students in WSU’s nursing administration MSN complete 43 credits. Core courses include statistical methods for healthcare research, nursing information management, and advanced health promotion. The nursing and organizational leadership focus requires classes in project management, financial resource management, and human resource management. Nursing students also complete 420 clinical hours. Like other master’s in nursing administration online programs, WSU lets online students arrange their clinical hours at an approved local site. Candidates for admission at WSU must hold a BSN with a minimum 3.0 GPA from a nationally accredited nursing program. Students who do not meet the GPA requirement may receive provisional admission. Prospective students must provide proof of a current registered nursing license, three references, and a statement of professional goals. WSU recommends a minimum of one year of clinical nursing experience. WSU provides an online tuition discount to residents of Minnesota, Wisconsin, and South Dakota. Winona State University is regionally accredited by the Higher Learning Commission (HLC). The nursing program also holds accreditation from the Commission on Collegiate Nursing Education (CCNE). Kennesaw State University ranks #10 on The 25 Best Online Master’s in Nursing Administration Degree Programs! A public institution in the Georgia university system, Kennesaw State University ranks as one of the largest schools in the country. The college’s 35,000 students can choose from 150 undergraduate and graduate degrees in fields such as education, construction, mathematics, and arts. The school also offers 70 distance learning programs, including an MSN in nursing leadership. Students can complete the online master’s degree in nursing administration in just 15 months. The 40-credit curriculum includes 10 credits of core courses and 30 credits in the specialization. All MSN students take theoretical foundation courses and complete a research project. Specialization courses include analytical business applications, leadership skills for advanced practice nursing, health policy leadership, and advanced nursing leadership roles. Nursing students also complete 315 practicum hours on leadership in nursing. Applicants to KSU’s leadership in nursing program must hold a BSN with a minimum 3.0 GPA from a nationally accredited institution. Candidates must also hold a current RN license in the state of Georgia. Prospective students submit two letters of reference and a formal statement of personal goals. Beginning in the summer of 2017, the WellStar School of Nursing eliminated the GRE requirement. KSU operates on the semester schedule. Kennesaw State University is regionally accredited by the Southern Association of Colleges and Schools Commission on Colleges (SACSCOC). The WellStar School of Nursing also holds accreditation from the Commission on Collegiate Nursing Education (CCNE). Sacred Heart University ranks among The 25 Best Online Master’s in Nursing Administration Degree Programs! Located in Fairfield, Connecticut, Sacred Heart University is the second-largest Catholic university in New England. The institution dates back to 1963, when it was founded by the bishop of the Diocese of Bridgeport. With campuses in Ireland and Luxembourg, the school maintains an international presence. SHU offers more than 70 degree options, including an online MSN with a nursing management and executive leadership specialization. The MSN in nursing administration at SHU prepares nurses for administrative and leadership positions in healthcare. The 36-credit degree includes 12 credits of core courses in healthcare policy, professional roles for nursing practice, and evidence-based practice. Students also complete 24 credits of specialized nursing management and executive leadership courses. Classes include management of financial resources, healthcare delivery systems, and role development for nursing management and executive leadership. Nursing students also take a 120-hour clinical practicum to build leadership skills. Unlike most other online nursing administration programs, SHU does not require a BSN. Applicants must have at least an associate degree in nursing and a bachelor’s in any subject area with a minimum 3.0 GPA. Students must also hold a current RN license. Prospective students submit a resume, a statement of professional goals, and two letters of recommendation. SHU does not require GRE scores. Admitted students can transfer in up to 12 credits of master’s-level courses. The program offers six start dates each year. Sacred Heart University is regionally accredited by the New England Association of Schools and Colleges (NEASC). The nursing program also holds accreditation from the Commission on Collegiate Nursing Education (CCNE). St. Joseph’s College of Maine ranks among The 25 Best Online Master’s in Nursing Administration Degree Programs! Founded as a liberal arts college in 1912, Saint Joseph’s College of Maine is the only Catholic college in the state. Located on the shore of Sebago Lake, SJC offers on-campus bachelor’s degrees and online master’s programs. The online MSN at SJC features four tracks, including a specialization in administration. The online master’s degree in nursing administration at SJC includes a capstone and a 135-hour practicum in nursing administration. Students complete 45 credits to earn the degree, including core courses in nursing informatics, organizational and systems leadership, and advanced health assessment. Nursing administration students then take 21 credits in their focus area, with options in health services administration, healthcare financial management, and strategic human resources management. Incoming students must have a BSN with a minimum 3.0 GPA from an accredited institution. Applicants must also hold a current RN license. Prospective students submit official transcripts, a resume or CV, a career statement, and three reference letters. These letters should come from the candidate’s peers, supervisors, and prior professors. SJC uses the cohort format. Twelve-week classes begin each February, May, August, and November. Saint Joseph’s College of Maine is regionally accredited by the New England Association of Schools and Colleges (NEASC). The nursing program also holds accreditation from the Commission on Collegiate Nursing Education (CCNE). Nebraska Methodist College of Nursing & Allied Health ranks among The 25 Best Online Master’s in Nursing Administration Degree Programs! Founded in 1891, Nebraska Methodist College of Nursing and Allied Health specializes in educating health professionals. NMC trains students through service-learning experiences and community-based education. The school’s online MSN degree features a nurse executive track for students interested in senior management positions. Nurses can complete the online MSN program in 21 months. Students take 36 credits of coursework, including classes in advanced nursing roles, organizational behavior, and human resource management for nurse executives. Nursing students also complete 126 practicum hours and two capstone experiences, both of which require an evidence-based project. The degree is one of the few master’s in nursing administration online programs offered through an institution that focuses exclusively on healthcare. NMC boasts over a century of experience educating nurses. To gain admission, prospective students must have a BSN from a state-approved or professionally accredited nursing program. Incoming students must also hold a current unencumbered RN license. Candidates with a GPA below 3.0 may qualify for provisional admission. The application also requires students to submit a resume and a written statement. NMC does not require the GRE. Admitted students can begin the program in January or August. Nebraska Methodist College of Nursing & Allied Health is regionally accredited by the Higher Learning Commission (HLC). The nursing program also holds accreditation from the Commission on Collegiate Nursing Education (CCNE). Regis University ranks among The 25 Best Online Master’s in Nursing Administration Degree Programs! Originally founded in 1877 by Jesuits in New Mexico, Regis College moved to Denver, Colorado in 1884. The school’s campus, a designated arboretum, now houses 1,200 trees and several historic buildings. The private Catholic institution offers more than 130 programs and 78 online degrees, including an online MSN in nursing leadership for RNs pursuing career advancement. The online master’s degree in nursing administration focuses on leadership in healthcare systems. The program also places a strong emphasis on management. Students complete seven semesters of full-time coursework, organized in eight-week terms. The 39-credit curriculum includes core classes in advanced nursing practice, healthcare policy, and evidence-based practice. Students also take management courses such as informatics and advanced financial management for nursing leaders. All nursing students take two practicums for a total of 210 hours. To enroll at Regis, prospective students submit official transcripts showing a BSN with a minimum 2.75 GPA. Applicants must hold a valid RN license. Regis prefers nurses with two years of clinical practice experience. Candidates also provide a current resume, a personal statement, and three recommendation letters. New students may begin in January, May, or August. Regis University is regionally accredited by the Higher Learning Commission (HLC). The Loretto Heights School of Nursing also holds accreditation from the Commission on Collegiate Nursing Education (CCNE). University of Wisconsin - Green Bay ranks among The 25 Best Online Master’s in Nursing Administration Degree Programs! From its campus near the shores of Lake Michigan, the University of Wisconsin–Green Bay offers travel opportunities, internships, and graduate-style research labs. Part of Michigan’s well-regarded public university system, UWGB offers both in-person and online degrees. The school’s MSN in leadership and management in health systems helps nurses improve outcomes in quality processes, cost savings, and patient satisfaction. UWGB’s online master’s degree in nursing administration is a part-time program for working nurses. Students can earn the MSN in as few as two years. The 34-credit degree incorporates 378 hours of clinical experience at a healthcare facility close to each student’s home or workplace. Students complete 13 required courses in economics and policy, leadership in health systems, and human resources. Learners also complete a capstone project in a healthcare setting. UWGB does not require a thesis. In order to enroll at UWGB, nurses must hold an accredited bachelor’s degree in nursing and a minimum 3.0 GPA. As part of the admissions process, prospective students submit three letters of evaluation, official transcripts from each previous college, and a written statement describing their career goals. UWGB enrolls new students in fall and spring. UWGB charges the same online tuition rate for in-state and out-of-state students. The University of Wisconsin–Green Bay is regionally accredited by the Higher Learning Commission (HLC). The nursing program also holds accreditation from the Commission on Collegiate Nursing Education (CCNE). University of Mary ranks among The 25 Best Online Master’s in Nursing Administration Degree Programs! Founded in 1959 by a Benedictine monastery, the University of Mary provides Catholic education in a coeducational context. In addition to its main campus in Bismarck, North Dakota, UMary operates campuses in Rome and Peru. UMary offers several degrees online, including an MSN in nursing leadership and management. UMary’s online master’s degree in nursing administration follows an accelerated format. The 36-credit curriculum includes coursework in influential nursing leadership, professional roles in advanced nursing, and human resource management. Nurses also complete practicums and 500 hours of practical leadership experience. During their final term, nursing students undergo a graduate studies assessment to ensure they have the requisite knowledge for graduation. Applicants to UMary’s MSN program submit two letters of reference, a resume, a goals statement, and official transcripts from all degree granting institutions. Candidates should have a current unencumbered registered nursing license and a minimum 2.75 GPA. UMary also offers an online MSN in nursing leadership and management for RNs with an associate degree in nursing rather than a bachelor’s degree. The University of Mary is regionally accredited by the Higher Learning Commission (HLC). The master’s program also holds accreditation from the Commission on Collegiate Nursing Education (CCNE). The University of Texas at Tyler ranks among The 25 Best Online Master’s in Nursing Administration Degree Programs! The University of Texas at Tyler, founded in 1971 as part of the public university system, offers more than 80 bachelor’s, master’s, and doctoral degrees. Despite its status as a rapidly growing university, UT Tyler maintains an 18-to-1 student-to-faculty ratio. The institution provides several online programs, including the online MSN in nursing administration. UT Tyler’s MSN program integrates essential leadership and management skills with current theory and research. Students take 36 credits in courses such as translational science, healthcare informatics, and leadership in healthcare. Distance learners also complete 112.5 hours of field work at an approved site in their local area. Students choose either a master’s thesis or a scholarly project. Prospective students must hold a BSN from a nationally accredited school. Candidates should also have a minimum 3.0 GPA in the last 60 credits of undergraduate work. Students who do not meet the minimum GPA requirement may receive conditional admission with qualifying GRE scores. Candidates must also provide three letters of recommendation, a resume, an admissions essay, and proof of a current RN license. UT Tyler admits new students in the fall and spring. The University of Texas at Tyler is regionally accredited by the Southern Association of Colleges and Schools Commission on Colleges (SACSCOC). The School of Nursing also holds accreditation from the Commission on Collegiate Nursing Education (CCNE). The University of Texas Medical Branch ranks among The 25 Best Online Master’s in Nursing Administration Degree Programs! Galveston’s University of Texas Medical Branch opened in 1891 as the country’s first public medical school and hospital. The institution trains healthcare professionals and provides healthcare for Texans. Today, UTMB operates as a major academic health science center, with degrees in all field of healthcare and medicine. Registered nurses can complete UTMB’s MSN executive nurse leader program in an online format. The online MSN in nursing administration prepares nurses for careers as executive leaders who influence and advance healthcare. UTMB students complete 39 credits of coursework in public health principles, transformational leadership, healthcare economics, and financial management. As with other master’s in nursing administration online programs, UTMB students complete clinical requirements at a local site. To enroll at UTMB, prospective students must hold a BSN from an accredited nursing program. Applicants submit official transcripts, proof of a minimum 3.0 GPA, and a letter of reference from a clinical manager. Candidates also write a personal statement explaining their professional goals and healthcare experience. All incoming students must hold an active unencumbered nursing license. Students should obtain a license or multi-state privilege to practice in the state where they plan to complete their clinical learning experience. UTMB prefers candidates with at least one year of nursing management or leadership experience. UTMB provides an online tuition discount for Texas residents. The University of Texas Medical Branch is regionally accredited by the Southern Association of Colleges and Schools Commission on Colleges (SACSCOC). The nursing program also holds accreditation from the Commission on Collegiate Nursing Education (CCNE). Lewis University ranks among The 25 Best Online Master’s in Nursing Administration Degree Programs! Founded in 1932 by the Archdiocese of Chicago, Lewis University once specialized in aviation technology. Today, the private Catholic university offers over 100 programs of study, including through its college of nursing. The institution’s online MSN in healthcare systems leadership assists nurses pursuing career advancement in administration. Lewis’s MSN program trains students in patient care services and nursing administration. Students build skills in finance, economics, human resources, and organizational management. The 36-credit MSN includes 18 credits of core courses, including applied biostatistics, healthcare organizations, and population health. Students also complete 18 credits in the leadership track, with courses in the dynamics of healthcare organizations, financial management for nurse leaders, and the business of healthcare. The program culminates in a healthcare systems leadership capstone project. As with many other online nursing administration programs, Lewis students arrange their clinical experience through an approved site in their local community. Prospective students must hold significant work experience, a minimum 3.0 undergraduate GPA, and a current RN license in the state where they reside. The program accepts students with a BSN or a bachelor’s degree in a field other than nursing. Candidates must submit a personal statement on their educational plans and career goals. Lewis University is regionally accredited by the Higher Learning Commission (HLC). The College of Nursing also holds accreditation from the Commission on Collegiate Nursing Education (CCNE). Wheeling Jesuit University ranks among The 25 Best Online Master’s in Nursing Administration Degree Programs! A private Catholic institution founded in 1954, Wheeling Jesuit University follows the 450-year Jesuit tradition of advanced education and service to others. In addition to the nearly 50 majors offered on campus, prospective WJU students can enroll in online education programs. The university’s master of science in nursing features several concentrations, including a nursing administration track. WJU’s online master’s degree in nursing administration prepares graduates for careers in healthcare leadership. Nursing students complete a total of 14 courses, including six classes in foundational topics such as healthcare policy, health assessment, and health promotion. The nursing administration track includes classes in financial management, organizational behavior, and communications and interpersonal relations. Students also take an elective and a practicum. During the final portion of the program, nurses complete a clinical experience at an approved site in their home community. In order to enroll in WJU’s nursing administration program, applicants must have a bachelor of science in nursing with a minimum 3.0 GPA. Prospective students submit three letters of recommendation, an admission essay, and GRE or MAT scores. Candidates must also hold a current RN license. WJU may ask certain applicants to complete an interview. WJU allows transfer students to apply up to six graduate credits toward the MSN. Wheeling Jesuit University is regionally accredited by the Higher Learning Commission (HLC). The Department of Nursing also holds accreditation from the Commission on Collegiate Nursing Education (CCNE). Western Governors University ranks among The 25 Best Online Master’s in Nursing Administration Degree Programs! Created when a group of U.S. governors proposed an innovative approach to higher education, Western Governors University provides online programs in business, education, technology, and healthcare. WGU’s competency-based model emphasizes self-paced learning instead of set semester schedules. Students may progress through coursework and begin new classes as quickly as they like, making it possible to earn a degree in a short amount of time. WGU also allows students with advanced skills in their field to test out of certain courses. As an RN-to-MSN program, WGU’s online MSN in nursing leadership and management accepts students that do not hold a BSN. Most students work while earning the degree. WGU’s program requires 36 courses, including bachelor’s-level nursing courses and classes in nursing leadership. Students demonstrate competency through assessments and hands-on projects. Prospective students must submit all relevant transcripts, a resume, and proof of an associate degree or diploma in nursing. Candidates should also currently work as RNs and hold valid nursing licenses. Students may enroll in new classes on the first day of every month. Distance learners pay a flat fee for each six-month term. Students should complete a minimum of eight credits each term. Western Governors University is regionally accredited by the Northwest Commission on Colleges and Universities (NWCCU). The nursing program also holds accreditation from the Commission on Collegiate Nursing Education (CCNE). California University of Pennsylvania ranks among The 25 Best Online Master’s in Nursing Administration Degree Programs! California University of Pennsylvania boasts a high student success rate; 99% of graduates are working or in graduate school. The school consistently ranks among the best schools in the Northeast. In addition to in-person degrees, U Cal offers several online options, including an online MSN in nursing administration and leadership. Nurses can complete the fully online program in just over a year of full-time study. The accelerated MSN at U Cal requires 30 credits of coursework. Classes include nursing organization and leadership theory, information systems for nurses, and nursing administration and leadership roles. All students complete a practicum course, which requires 150 hours of work under a preceptor’s guidance. Nursing students work on a quality improvement project for their current place of employment. The program follows a cohort format. Prospective students must hold a bachelor of science in nursing with a minimum 3.0 GPA in the last 60 undergraduate credits. Students who do not meet the GPA requirement may apply for conditional admission. Candidates must also hold a valid registered nursing license and submit a current resume showing at least one year of experience as a nurse. Applicants write an essay on career goals and objectives. In addition to the online master’s degree in nursing administration, Cal U offers an MSN-MBA dual degree program. California University of Pennsylvania is regionally accredited by the Middle States Commission on Higher Education (MSCHE). The nursing program also holds accreditation from the Commission on Collegiate Nursing Education (CCNE). Northwest Nazarene University ranks among The 25 Best Online Master’s in Nursing Administration Degree Programs! A private Christian institution, Northwest Nazarene University was founded in Nampa, Idaho in 1913. NNU offers more than 60 areas of study, including 18 master’s degrees and several online degree options. Students pursuing an online MSN can choose from several tracks, including an emphasis in leadership and education. NNU uses the cohort model to build an interactive, collaborative learning environment. Nursing students complete 36 credits of coursework, including classes in leadership perspectives, advanced health assessment, and organization leadership for improving health outcomes. Full-time students take up to nine credits per semester. All students undergo an internship to gain professional experience. Unlike many master’s in nursing administration online programs, NNU accepts applicants with an associate degree and a valid registered nursing license. Nurses with an associate degree can earn the MSN in three years, while those with a BSN can complete the master’s in as little as two years. Applicants submit proof of a nursing degree from a regionally accredited college or university, a current RN license, and a minimum 3.0 GPA. Candidates who do not meet the GPA requirement may receive provisional admission. All applicants submit a personal essay on their career and educational goals. Northwest Nazarene University is regionally accredited by the Northwest Commission on Colleges and Universities (NWCCU). The nursing program also holds accreditation from the Commission on Collegiate Nursing Education (CCNE). Saint Xavier University ranks among The 25 Best Online Master’s in Nursing Administration Degree Programs! Originally a women’s college founded by the Sisters of Mercy, Saint Xavier University lost its original campus in the Great Chicago Fire of 1871. Today, SXU confers degrees from its Mt. Greenwood neighborhood campus and online learning platform. The school offers several master’s degrees in nursing, including an MSN in executive leadership for nurses who want to move into upper management. Unlike many online nursing administration programs, the MSN at SXU prepares graduates for the Nurse Executive Board certification exam. Graduates also qualify for advanced board certification with additional work experience. Coursework focuses on implementing quality protocols, budgeting, managing projects, and strategic planning. The 35-credit curriculum includes 18 credits of core classes in nursing and 17 credits of specialized classes. Executive leadership courses include advanced healthcare finance, administrative leadership in nursing, and advanced health and social policy. In order to enroll at SXU, candidates must hold a current registered nursing license with at least five years of full-time experience. Applicants should also have a bachelor of science in nursing and a minimum 2.75 GPA. Prospective students submit an application form, official transcripts from all colleges and universities attended, and a copy of a current RN license with proof of work status. Applicants should also submit a written recommendation and a current resume. Distance learners can complete their practicum anywhere in the U.S. Students in the program must work full time. Saint Xavier University is regionally accredited by the Higher Learning Commission (HLC). The School of Nursing also holds accreditation from the Commission on Collegiate Nursing Education (CCNE). Carlow University ranks among The 25 Best Online Master’s in Nursing Administration Degree Programs! Named after the county in Ireland where the Sisters of Mercy bought land in 1843, Carlow University is a private Catholic institution located in Pittsburgh. Carlow offers well-regarded undergraduate and graduate degrees in nursing. In 2017, 100% of Carlow’s BSN graduates passed the NCLEX exam on their first attempt. Carlow provides several fully online degree options, including an MSN in nursing education and leadership. The Carlow MSN program prepares graduates for advanced roles in education, administration, and clinical practice. Nurses can earn the 33-credit degree in as little as 22 months. Courses last either eight weeks or 16 weeks. Unlike other online nursing administration programs, Carlow’s MSN covers both management and nursing education. Students complete courses in nursing leadership, evidence-based practice, leadership styles in healthcare, and fiscal management. The program culminates in a three-credit nursing leadership internship. Applicants to Carlow’s graduate nursing program must hold a BSN with a minimum 3.0 GPA from an accredited program. Prospective students submit official transcripts, a copy of their current registered nurse license, an admissions essay, and a current resume or CV. Candidates also send two letters of recommendation, one from a faculty member and the other from a clinical supervisor. Carlow may conduct personal interviews with candidates. Carlow does not require GRE or GMAT scores. Carlow University is regionally accredited by the Middle States Commission on Higher Education (MSCHE). The nursing program also holds accreditation from the Commission on Collegiate Nursing Education (CCNE). Online nursing administration programs build students' core nursing abilities and management skills. With classes focused on leadership and executive-level experience from the perspective of healthcare systems, nurse administration students gain valuable knowledge that leads to professional growth. Graduates work in nursing administration, managing staff and organizing healthcare resources. This degree also qualifies nurses for the nurse executive board certification process. Nurses considering an online master’s degree in nursing administration should explore programs that fit their interests and career goals. Each program offers its own curriculum and clinical practicum requirements, which affects degree completion times. Some master’s in nursing administration online programs offer students the ability to choose electives, including nursing education. While most programs require a bachelor’s degree in nursing, some accept RNs with an associate degree or offer RN-to-MSN bridge courses. Nursing administration programs differ when it comes to their admission requirements and graduation requirements. Most require practicum experience, and others expect a research project or thesis. By researching the top master’s in nursing administration online programs, RNs can find the best educational fit to advance in their careers. Most nursing administration programs offer a mix of core courses in advanced nursing and specialized leadership and management classes. The curriculum cultivates nurses with strong clinical and management skills, preparing graduates for careers in nursing administration. Many master’s in nursing administration online programs incorporate similar core coursework. Advanced health assessment: Most MSN programs include core classes, such as advanced health assessment. Students build health assessment skills with patients of all ages by taking health histories and conducting physical exams. The class may incorporate a practicum to build clinical experience. Organizational behavior: Nurse administration students explore organizational theory, management theory, and how these apply within nursing. Coursework emphasizes leadership issues, evidence-based management, promoting a culture of safety, and organizational development for healthcare systems. Financial management for nurses: Health administrators need strong training in financial management. Courses in financial management for nurses emphasize budgeting systems, internal control, and other management control techniques. The coursework integrates concepts in cost analysis, capital budgeting, and informatics within the healthcare field. Nurse executive: Offered by the American Nurses Credentialing Center, the nurse executive board certified credential demonstrates entry-level clinical knowledge and executive-level qualifications. Candidates must hold a valid RN license, meet the educational requirements, and carry at least two years of mid-level administrative experience. An online master’s degree in nursing administration fulfills this educational requirement. This certification is valid for five years. Nurse executive, advanced: Experienced nurse administrators earn the nurse executive advanced-board certified credential through the American Nurses Credentialing Center. Candidates should hold an RN license, a minimum of a master’s degree in nursing, and at least two years of experience in an administrative position. To earn this certification, candidates must pass a 175-question examination. After earning a master’s in nursing administration, graduates may pursue a variety of career paths. Some work as nurse administrators, while others hold titles, such as nurse manager, nursing supervisor, or director of nursing. At the top levels, nurse administrators work as chief nursing officers. These positions require management training and experience, which nurses gain through online nursing administration programs. Registered Nurse: RNs provide patient care within the healthcare system. While the entry-level degree requirement stands at an associate degree in nursing, a master’s degree qualifies RNs for advanced positions, including management and administration. The BLS predicts this field to grow 15% by 2026. Nurse Manager/Administrator: Medical services managers plan, direct, and coordinate services within a healthcare system. Nurse manager and administrator positions require both clinical experience and management training. Most positions mandate a master’s degree in a management or executive specialty, including nurse administration. The top online nursing administration programs receive proper accreditation, which serves as a marker of academic quality. Accrediting agencies evaluate colleges, universities, and specific programs to ensure they meet high educational standards. At the institutional level, regional accreditation holds the most prestige, and many master’s in nursing administration online programs only accept candidates with a bachelor’s degree from a regionally accredited institution. In addition to regional accreditation, nursing programs undergo specialized accreditation, most commonly through the Commission on Collegiate Nursing Education (CCNE). Operated by the American Association of Colleges of Nursing, the CCNE grants accreditation to nursing programs through a voluntary, self-regulatory process. The process encourages self-assessment and supports the improvement of nursing education. Prospective students should carefully research an institution’s accreditation status, as it affects financial aid, transfer credits, and future job prospects. Nurse administrators benefit from professional organizations devoted to promoting excellence within nursing. These organizations offer networking opportunities, continuing education programs, and research developments. Many host annual conferences and provide career services support and job boards, with resources both for current students and working professionals. Some also offer scholarships for nursing administration students, including students in online nursing administration programs. By joining a professional organization, nurse administrators and students gain access to a wealth of support and resources. American Organization of Nurse Executives: Founded in 1967, the AONE promotes nursing leadership excellence. Members gain access to publications, development resources, and networking opportunities. American Nurses Association: One of the largest professional organizations in the country, the ANA boasts over three million members. Nurses gain professional development resources, job opportunities, and personal benefits by becoming members. American Academy of Nursing: The AAN advocates for nursing professionals and effective nursing leadership. The organization offers scholarly resources, awards and scholarships, and employment opportunities.